When looking to study the most distant objects in the Universe, astronomers often rely on a technique known as Gravitational Lensing. Based on the principles of Einstein’s Theory of General Relativity, this technique involves relying on a large distribution of matter (such as a galaxy cluster or star) to magnify the light coming from a distant object, thereby making it appear brighter and larger. This technique has allowed for the study of individual stars in distant galaxies. In a recent study, an international team of astronomers used a galaxy cluster to study the farthest individual star ever seen in the Universe. Although it normally to faint to observe, the presence of a foreground galaxy cluster allowed the team to study the star in order to test a theory about dark matter. The study which describes their research recently appeared in the scientific journal Nature Astronomy under the title “Extreme magnification of an individual star at redshift 1.5 by a galaxy-cluster lens“. 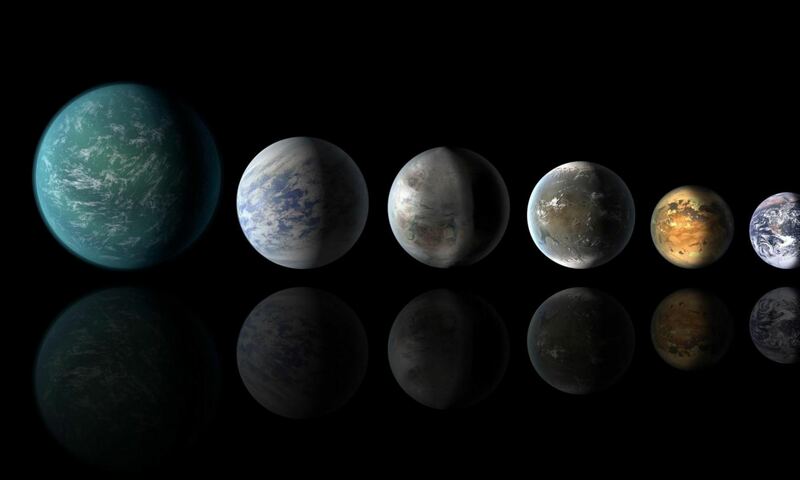 The study was led by Patrick L. Kelly, an assistant professor the University of Minnesota, and included members from the Las Cumbres Observatory, the National Optical Astronomical Observatory, the Harvard-Smithsonian Center for Astrophysics (CfA), the Ecole Polytechnique Federale de Lausanne (EPFL), and multiple universities and research institutions. For the sake of their study, Prof. Kelly and his associates used the galaxy cluster known as MACS J1149+2223 as their lens. Located about 5 billion light-years from Earth, this galaxy cluster sits between the Solar System and the galaxy that contains Icarus. 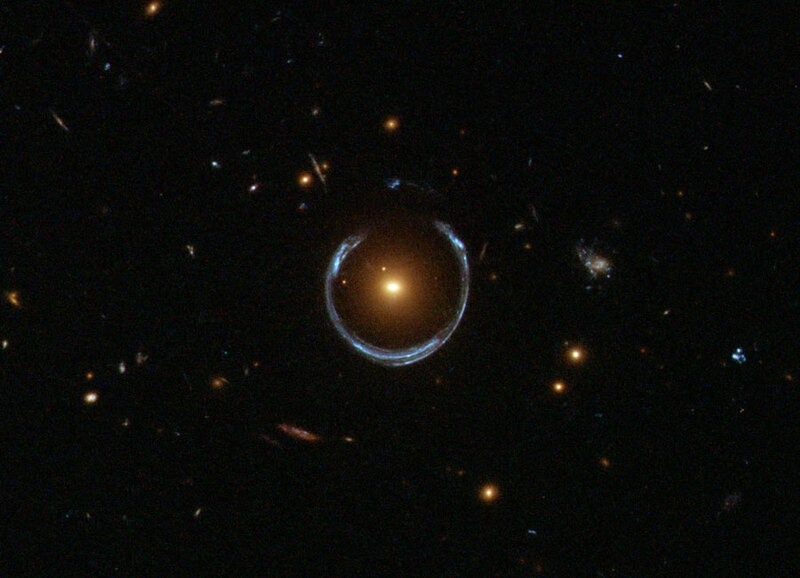 By combining Hubble’s resolution and sensitivity with the strength of this gravitational lens, the team was able to see and study Icarus, a blue giant. Icarus, named after the Greek mythological figure who flew too close to the Sun, has had a rather interesting history. At a distance of roughly 9 billion light-years from Earth, the star appears to us as it did when the Universe was just 4.4 billion years old. In April of 2016, the star temporarily brightened to 2,000 times its normal luminosity thanks to the gravitational amplification of a star in MACS J1149+2223. 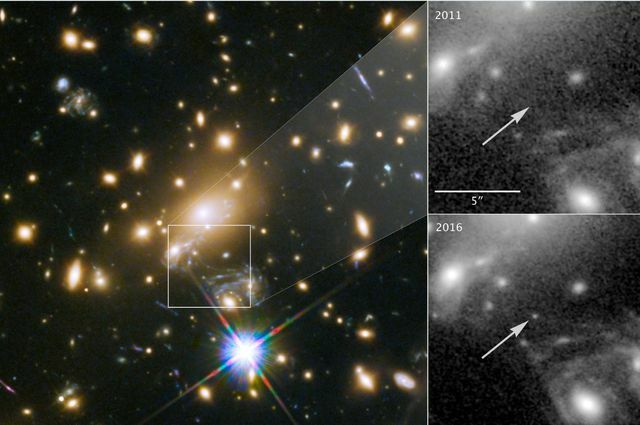 Kelly and a team of astronomers had been using Hubble and MACS J1149+2223 to magnify and monitor a supernova in the distant spiral galaxy at the time when they spotted the new point of light not far away. Given the position of the new source, they determined that it should be much more highly magnified than the supernova. What’s more, previous studies of this galaxy had not shown the light source, indicating that it was being lensed. “The star is so compact that it acts as a pinhole and provides a very sharp beam of light. The beam shines through the foreground cluster of galaxies, acting as a cosmic magnifying glass… Finding more such events is very important to make progress in our understanding of the fundamental composition of the universe. In this case, the star’s light provided a unique opportunity to test a theory about the invisible mass (aka. “dark matter”) that permeates the Universe. Basically, the team used the pinpoint light source provided by the background star to probe the intervening galaxy cluster and see if it contained huge numbers of primordial black holes, which are considered to be a potential candidate for dark matter. These black holes are believed to have formed during the birth of the Universe and have masses tens of times larger than the Sun. However, the results of this test showed that light fluctuations from the background star, which had been monitored by Hubble for thirteen years, disfavor this theory. If dark matter were indeed made up of tiny black holes, the light coming from Icarus would have looked much different. Since it was discovered in 2016 using the gravitational lensing method, Icarus has provided a new way for astronomers to observe and study individual stars in distant galaxies. In so doing, astronomers are able to get a rare and detailed look at individual stars in the early Universe and see how they (and not just galaxies and clusters) evolved over time. When the James Webb Space Telescope (JWST) is deployed in 2020, astronomers expect to get an even better look and learn so much more about this mysterious period in cosmic history.